Tokens. A blog by Artist David Wills. : Glossy. Epicurean 36. Epicurean was a bold editorial adventure published in the mid 1960s through to the late 1970s. 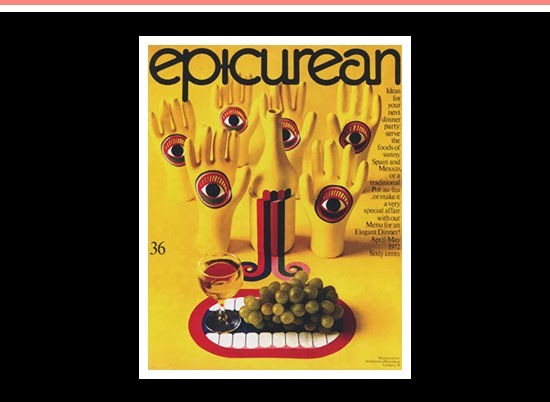 With a changing masthead, sometimes surreal covers and a bold use of typography and colour, Epicurean was one of Australia's first magazines devoted to food and wine. In 2010 Dominic Hofstede curated an exhibition of all 77 covers designed by American graphic artist Les Mason at Melbourne's The Narrows. I wish I'd been able to go, but for now I'm happy looking at this amusing cover putting rubber gloves to inventive use.